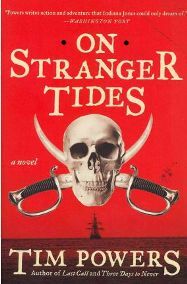 On Stranger Tides by Tim Powers is the novel upon which the latest Pirates of the Caribbean film is based. Originally published in 2006, it has recently been re-released in paperback and Kindle format to coincide with the film’s release. As a fan of the movie series, when I happened upon Powers’ novel available for pre-order at a bargain price in the recent Kindle sale, I decided to give it a go. Set in the 1700s, the main character is John Chandagnac, who is travelling from England to the Caribbean to track down his uncle, who conned his way into inheriting Chandagnac’s grandfathers whole estate, by claiming his brother, Chandagnac’s father, was dead. Aboard the ship, Chandagnac meets the lovely Beth Hurwood, but their friendship is interrupted by pirates – who force Chandagnac to join them or die. Among the pirates, he becomes Jack Shandy, and although he continues to hope for a chance to reclaim his fathers inheritance, he soon becomes embroiled in violence and magic, and the schemes of the infamous Blackbeard. The first thing to note about this novel is that the newest Pirates movie is based upon it, not the other way round. Powers wrote a pirate novel several years ago, the story of which has formed the basis of the movie. You won’t find Jack Sparrow (sorry, CAPTAIN Jack Sparrow) weaving drunkenly across the pages of On Stranger Tides. On Stranger Tides is quite a hard novel to get into. It’s a slow-burner. I found the introduction strange, and it took me some time to connect it to the main body of the story. There is a heavy emphasis on magic and voodoo in the novel, much more so than you are used to if you are a Pirates of the Caribbean fan. All the pirates use it to some degree, even newcomer Shandy becomes quite adept and relies on it. As I say, On Stranger Tides is a slow-burner, and although I enjoyed it from early on, it took a while for me to become really hooked on the story – but it did happen (and very annoyingly, the day I would have finished the novel, I forgot to take my Kindle to read on the tube and so didn’t finish it until I got home). The various story arcs were exciting and interesting, and as the novel approaches its conclusion I couldn’t wait to see what was going to become of everyone. Powers’ writing is very atmospheric. He is clear in his descriptions so it is easy to understand the scenes he is describing, but also very descriptive so that you really get a good picture of the landscapes and ships which feature in the story. One thing which the novel awakened in me, and which the movie series has not, was a desire to know more about the real pirates of the Caribbean in the eighteenth century. I always find it a point in a novel’s favour if it causes me to want to learn about the historical period or the region it is set in – although I could do with a break from that as my to-read list has reached epic proportions. Despite it taking a while to get going, I thoroughly enjoyed On Stranger Tides and look forward to seeing how the story is incorporated into the movie. And I will certainly be trying other novels by Tim Powers (in fact, On Stranger Tides on Kindle has now gone up in price on Amazon, but another of his novels, Declare, is only £1). No Comments on "On Stranger Tides"